This video will show you how to Install Windows 8.1 on an External USB Windows To Go. So I get loads of people on the 123myIT.com website and on the YouTube channel about how can they install Windows on an external drive USB drive so they can just carry that around and use the USB to plug into their Mac or PC hardware. Well I was able to find a solution for this issue from most people and it is Microsoft’s “Windows to Go”. This allows you to install Windows on an external USB drive to and allows you to run the a copy of Windows basically on any PC or Mac, without having to go ahead and install it locally. Is Windows to go the answer? * You can save disk space on the PC or Mac local drive. * Its very portable, which means you can carry the hard drive and plug it into a friends or work PC. * Your files stay on the USB so its safer. * You can also setup the drive to be encrypted, which means if you lose the drive no one will be able to get your data. Ok so let get into it. What do you need to make this happen. You will need a few things. The first is you will need to get yourself a copy of Windows Enterprise. This is a special copy of Windows designed to large companies, however I found a place where you can get the Evaluation version. So to do that watch this video. The next step is to install that Enterprise copy like you would on a Mac or PC. To help out I made a video on how this is possible to install it on a Mac. Watch the video below. Of course you will need an external USB drive to install Windows too. I suggest a USB 3 external hard drive with at least 40GB of disk space. You might be able to get away with a smaller drive but I would advise it, because you may want to have some space for App like Mcirosoft Office or some personal data like photos and videos. Well I hope this helps out guys and good luck! This video will show you Where to Download Windows 8.1 Enterprise Evaluation. I have had allot of people on the 123myIT YouTube channel ask me how to install Windows on an external USB drive so that they can just carry the USB around and boot to it from any computer and run Windows without the need to completely install it on their Mac or PC. Well in truth you cant do it with a the normal consumer grade versions of Windows. So I am talking about Windows 8.1, Windows 8.1 Student or Windows 8.1 Pro. However you can do it with Windows 8.1 Enterprise version which is a version of Windows supplied for large corporate enterprise companies. So you might say well that’s great Matt but how do I get a copy of this. My answer would be that will allot of money you might be able to buy yourself a copy. However I was able to find Where to Download Windows 8.1 Enterprise Evaluation version. This is an Evaluation version of Windows 8.1 Enterprise and I am not sure how long it might last for. But for those that really want to try and install Windows on an external USB drive this might be a cheap solution for you. You will need a Microsoft account to get a copy, this can be a Hotmail, Outlook or Live account. The video above will show you where to Download Windows 8.1 Enterprise Evaluation version. Once you have the Windows 8.1 Enterprise Evaluation ISO downloaded you will be able to use this copy to create what Microsoft call Windows to Go USB drive. Shortly I will create a video on how to setup Microsoft to Go, until the you can get notifications when this video has been released by subscribing to the 123myIT.com YouTube channel, direct link here. For more information on Microsoft’s Windows to Go you can find the official page here. This video is for users that have purchased Windows from the 123myIT.com Store or Microsoft and will show you how to open and install Windows 7, 8, 8.1 Themes. These themes are FREE to download and install. Tis the season to be jolly! And since everyone has probably started decorating their home with some Christmas decorations, why not do the same with your Windows computer? I have been using these Windows themes for about a year now and they are pretty awesome, and now I have just downloaded and I am running the Christmas theme. Its pretty cool it will refresh your back ground every now and then with a new high definition back ground and when you get sick of it you can simple go and download a new one. For a while I was using the Antarctic theme, see the picture below. I have to say it defiantly brightens up your Desktop back ground and lets face it we probably look at our devices allot during the day so why not brighten it up somewhat? Plus they are all FREE to download and use if you have the full version of Windows 7, 8, 8.1. For Cat and Animal lovers their is a whole swag of different animal themes that you can add. Check out the Cats Everywhere theme picture below. If you want to download the themes you can find the link under the 123myIT.com Downloads page here. Of if you want the direct link you can get it here. This video will show you how to Create a bootable Windows 8.1 USB on a Mac running OSX Yosemite. Allot of 123myIT users have decided to take the plunge and upgrade their Mac OS X to Yosemite and I thought it might be a good idea to do a short video on how to create a bootable Windows 8.1 USB on a Mac running OSX Yosemite. This video is mainly for people that want to be able to create a USB installer disk drive, so that they can install Windows on any computer whether it be a Mac or another brand. This method can also be used at a later date to reinstall Windows on the same Mac that you create the USB drive on. So in the example in the video I created the USB on a early 2014 MacBook Air. In this process it also downloaded the Windows support software for this Mac hardware. This means it will run the boot camp installer after Windows gets installed. See the picture below. So the If you want to check out the list of Windows support software or boot camp drives for your Mac a great place to start is the 123myIT boot camp drivers page here. In the photo above you can see a picture or the Yosemite desktop as the Windows files are being copied to the USB drive. If you want more info on Apple Boot Camp you can find the official link here. If you want to find out more about OS X Yosemite you can go to the official Apple page here. Want to buy Windows 8.1? Check out the 123myIT.com Store page here. 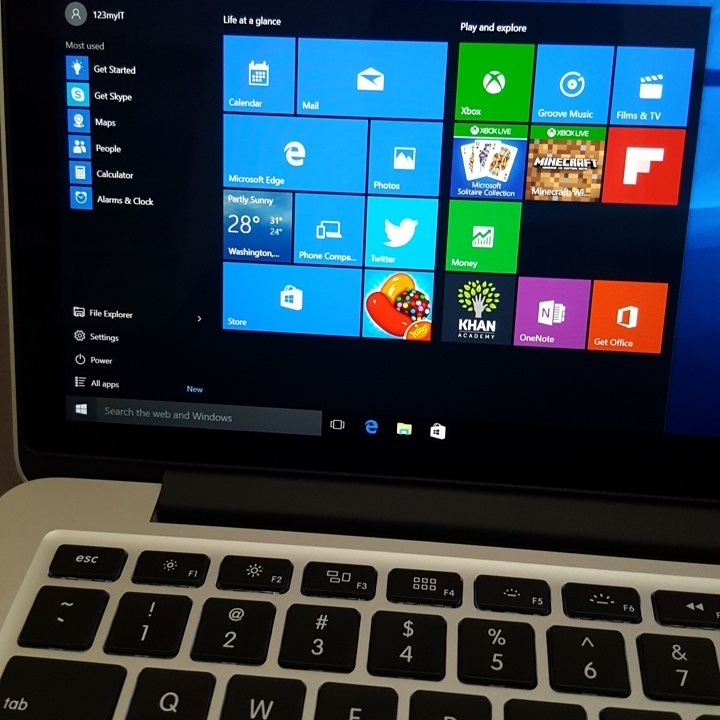 This video will show you how to Install Windows 8.1 on a Mac running OS X Yosemite. For this guide you will need the Windows 8.1 iSO file and an 8GB or larger USB drive. So the long awaited video of how to Install Windows 8.1 on a Mac running OS X Yosemite is finally here. I have tried to add in as much important tips as I could without making the video too long and I hope it helps those of you that run into some issues with the install. * Windows iso file permission error. For some reason users get this issue with the Windows iso file is placed on the desktop. Its like Yosemite has permissions that doesn’t allow files on the desktop to be mounted for some reason. Copying the file to the users documents directory should fix this issue. * GPT partition error. I have already setup a video with some tips on how to solve this GPT partitioning error. So click the link to the video if you are having issues with that. Hopefully those tips will get it working for you. * Touchpad & Volume buttons don’t work. To solve this issue you will need to download the Windows support software or Boot Camp drivers. To do that click here for a link to download the this software for your model of Mac. If you have any comments or questions please feel free to ask also if you need a copy of Windows 8.1 you can buy it through the 123myIT store or download the Preview copy from the 123myIT downloads page. Want to know more about Yosemite? Direct link to Apple here.